Principe Borghese: this tomato is listed as a great drying tomato - they are a lot smaller than I expected, even smaller than the volunteer cherry tomatoes! They are firm and meaty with few seeds. Pretty tasty but not overly sweet, fresh. Moscovich Extra Early: I expected these to happen in June or July, but two months of fog doesn't encourage me to do much, either. These are a great dark red, tender and very sweet. Yellow Ruffled: very mild flavor, not exciting. We have only had a couple of these so far, so the jury is still out. Amana Orange: these are really pretty tomatoes -- the size has varied, but most of them aren't yet ripe. They are tasty but I haven't decided if I want to grow them again next year, yet. Deberao: a nice red paste tomato - this has the most outstanding flavor of any plum tomato I have ever bought. I plan to grow a lot more of these next year for canning. 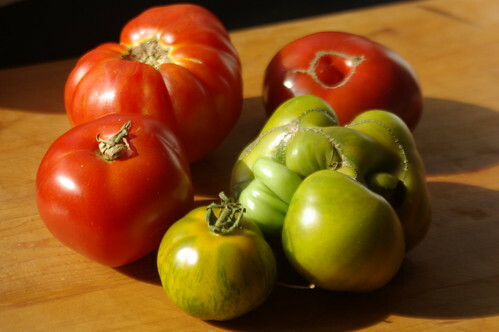 Aunt Ruby's German Green: outstanding flavor, juicy, meaty and we can't wait for more to ripen! I will definitely grow these next year. Paul Robeson: Very large, gorgeous and very delicious tomatoes. Definitely growing these next year. Brandywine: A late season tomato which can't seem to wait for the earlies and mids to finish up! These are pretty tasty, I can see why they are a favorite and I'll definitely grow more next year. Green Zebra: these are really good, but they have to be really ripe when you eat them or they don't have much flavor. I'll have one of these plants next year, for sure. Italian Tree: the plant near the fence with more space got about 12' high, but the other plants were more closely planted and didn't get nearly as high. These are really big tomatoes, as big as the Paul Robesons and have a great flavor. Most still aren't ripe, so we'll have more feedback on these later. Aker's West Virginia: a few of these ripened and they are great! Black Cherry: the most amazing cherry tomato ever. Definitely growing next year. Peacevine Cherry: small and delicious, I can't believe I only put in one plant! Super Snow White: large white-yellow cherry tomatoes, tart and citrusy. I like them but not sure about growing them again next year. Blondkopfchen: tiny yellow-gold cherry tomatoes, these are really good when they are really ripe. I'll definitely have one of these plants next year. Aunt Ruby's Yellow Cherry: tasty but not exciting. I need a couple of hot days to really decide on this one. Late Tomatoes: still waiting on Hawaiian Pineapple and Wonderlight. The Wonderlight plants barely germinated, I have two small, stunted plants that have about four large plum tomatoes that aren't ripe yet. Notes: The tomatoes in pots did not do as well as the plants in the ground. I'm seriously considering doing raised beds next year as I think this will resolve drainage and spacing issues. "French Intensive" is a method of raised bed gardening that allows planting things more closely together. It should also help keep the slugs out of my garden. PEAR PRESERVATION: James and I juiced up a pile of Asian pears -- it made fantastic juice, though I did notice that leaving the skins on gave the juice a bit of a fermented taste and the juice darkened up a lot more. MORE FORAGING: After breakfast, we headed over to his friend's house to pick more Asian pears and Meyer lemons, then we went over to Larissa's to pick her quince tree. DRYING: Around 11:30, the sun started to come out so we put the pears back in the solar dehydrator. Then, the fog rolled back in. Fog is not good for using a solar dehydrator.